21:30 The first day of the three-day conference draws to a close. Thanks for following Ahram Online's live coverage. 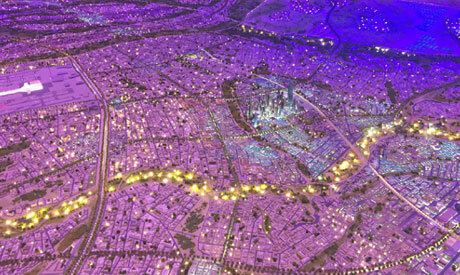 21:15 Egypt’s new capital will be built on an area of 700 square kilometres, (490 of which will be for urban development), east of Cairo, at a total cost of $45 billion, Minister of Housing Mostafa Madbouly announced at the conference. The city will be located between Cairo and the planned Suez Canal hub north west of the Gulf of Suez, and flanked on both sides by two of Egypt’s major highways, the Suez road and the Ain Sokhna road. It will include 1.1 million residential units to house 5 million inhabitants, as well as an administrative district on 1000 acres of land, with a presidential palace, ministries, government bodies, and embassies, as well as a financial district, he said. 21:00 “This event marks an important step for Egypt. It shows that Egypt is open for business,” said World Bank Managing Director Sri Mulyani Indrawati. “Egypt has some way to go,” in terms of reform, she said, stressing the need for adjusting public spending to improve productivity and address inequality, improving the social safety net, and promoting fair competition to encourage private sector participation. The full text of her speech is available here. 20:45 There is great potential for investment in Egypt and the Egyptian market is accommodating, Russian Minister of Economic Development Alexei Ulyukayev says in his speech. Russian President Vladimir Putin’s visit to Egypt in February boosted cooperation with Egypt in nuclear energy, hydroelectric power stations, environmentally-friendly energy sources and oil extraction, the minister added. Russian companies extract 20% of the oil produced in Egypt, according to Ulyukayev. 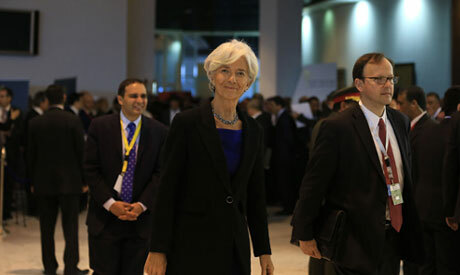 20:30 Christine Lagarde, the managing director of the IMF, praised Egypt's economic reforms measures undertaken during the last year, namely subsidy cuts and sales tax hikes on cigarettes and alcohol. Speaking to the delegates, she emphasised the importance of keeping reforms on track and securing inclusive growth to foster people’s trust in the government. "Clearly, staying the course on the reform agenda is a first order priority. But there are other policies which can improve confidence, create jobs, and support Egypt’s financial independence." 20:15 The French Development Agency will provide a 40 million euros sovereign loan to finance a power plant in Kom Ombo in Upper Egypt, France's Minister of Finance Michel Sapin told Ahram Online at Egypt's conference in Sharm El-Sheikh on Friday. "The French firms I talked to are now ready to invest in Egypt," Sapin told Ahram Online's reporter at the event, adding that 30 large French companies were present at the conference. "This conference marks the return of Egypt on the economic and financial world map," he said. Concerns about Egypt's security situation did not rank high in French investors' considerations, the minister implied. "They are not afraid of security issues; there is no such thing as absolute security but the situation in Egypt is definitely improving," said Sapin. 18:50 “Your war is our war, and your stability is our stability,” says Italian Prime Minister Matteo Renzi, in reference to Egypt's ongoing fight against Islamist militants. "The issue is not about Egypt or the region only, but also about Italy and the rest of the world." Renzi invites President Abdel-Fattah El-Sisi to Milan for an energy exhibition and for discussion on regional matters. 18:40 The Spanish representative says that more than 20 Spanish companies are present at the conference today. The economic and the political development go hand in hand, Kerry said, stressing the importance of paying attention to protecting individual rights and maintaing an unbiased justice system. Kerry praised economic and legislative reform undertaken by El-Sisi’s government, citing subsidy cuts and a new investment law establishing a one-stop-shop for investors to facilitate business procedures. One of the main demands behind Egypt’s January 25 Revolution was the social justice, Kerry said. The economic conference should not yield positive outcomes solely for some Egyptians but for all Egyptians, he added. Kerry reiterated his country’s support for Egypt in the collective war against terrorism. The US secretary of state also praised El-Sisi’s initiatives to fight corruption, a move he said was crucial for investor security. “We are all meeting here as we have interests in the success of Egypt,” says Kerry. 18:15 China's Minister of Commerce Gao Hucheng said that his attendance at the economic conference reflects the great care China allocates to good bilateral relations with Egypt. The Chinese envoy said that since President Xi Jinping came to power, he has put Africa among his top international priorities. Economic cooperation between Egypt and China has been increasing recently, Gao said, in communications, energy and other fields. Chinese projects in Egypt have created more than 10,000 job opportunities, he said. China also intends to strengthen cooperation with Egypt in industry, construction of ports, tunnels and infrastructure, as well as in planned investments in the Suez Canal development, clean energy, culture and tourism, Gao said. 18:10 Aqila Saleh, the speaker of the Libyan House of Representatives, says Libya supports the fight against the Islamic State group and other militant groups. “Human development is the core of sustainable development,” says Saleh. He also warns against the proliferation of arms and the absence of security in the region. Saleh calls on rich Gulf countries to invest part of its oil profits in the rest of the Arab world. 18:00 Oman pledges $500 million to Egypt, half as financial aid, and the other half in the form of investments, the Sultanate’s prime minister announces in his speech. 17:55 Ethiopian Prime Minister Hailemariam Desalegn addresses the conference, praising the event as a "great opportunity" for Egypt to seek investment. “The Nile constitutes a common destiny: we either sink or swim together. You know, Mr. President, we chose to swim together,” he says, reference the Nile river, a major tributary of which begins in the Ethiopian highlands. Relations between Ethiopia and Egypt have at times been strained, with Egypt voicing concerns about the potential negative impacts of Ethiopia's Grand Renaissance Dam project on the flow of Nile water reaching Egypt. The foreign ministers of Egypt, Sudan and Ethiopia recently reached a preliminary agreement on sharing the Nile’s waters and on the operation of the under-construction dam. 17:40 Lebanese Prime Minister Tammam Salam tells delegates the Lebanese people salute Egypt, knowing well what economic hardship means. "Investing in Egypt is an investment in Arab national security,” says Sallam. 17:35 Vice president of Tanzania, Mohamed Gharib Bilal, addresses the conference, saying that Egypt plays a significant role in Africa. 17:30 Mali's President Ibrahim Boubacar Keita addresses the conference, stressing the excellent relations between Egypt and Mali and saying that the two countries are tied by a "common destiny." 17:15 Palestinian President Mahmoud Abbas addresses the conference, saying that this conference is evidence of the support for Egypt’s people and leadership. “We express the support of the Palestinian people to Egyptians in their war against terrorism. (Egypt) with its army, and with the support of the brotherly countries will be able to eliminate the terrorism,” he says. 17:05 Omar Al-Bashir, the president of Sudan, is speaking now. He promises cooperation in the agricultural sector between Egypt and Sudan, saying that Sudan has land and water, while Egypt has human resources and expertise, while Gulf countries can provide financing. Al-Bashir added that a new border crossing between Egypt and Sudan would soon be opened at Arqin in order to help Egyptian exports reach Africa. 17:00 Mohamed bin Rashed Al-Maktoum, vice president of the UAE and ruler of Dubai, pledges $4 billion to Egypt; $2 billion will be provided as deposits at the central bank while the other $2 billion will be allocated to stimulate the economy through a number of initiatives that will be announced later. 16:50 Third to speak is Crown Prince Muqrin bin Abdel-Aziz of Saudi Arabia, who announces in his speech that Saudi Arabia will extend $4 billion in financial aid and private investments to Egypt, including a $1 billion deposit in Egypt’s Central Bank. 16:40 Following El-Sisi's address, Kuwait's emir Sheikh Sabah Al-Ahmed Al-Sabah says that Kuwaiti institutions have allocated $4 billion for investment in various sectors in Egypt. 16:25 El-Sisi also promised immediate strategies and clear policies to support the private sector and foreign investors, and reiterated Egypt’s commitment to paying the arrears owed to foreign companies. Reforms will guarantee equal opportunities for investment, and a new antitrust law opens the doors to fair competition. Egypt is aiming to boost growth to at least 6% in the coming 5 years and to decrease the unemployment rate to 10 percent, he adds. 16:20 Egypt has put in place a sustainable long-term development strategy until 2030, El-Sisi says. Egypt’s economy does not rely on mega-projects alone but on a clear economic vision committed to a free market economy and private sector participation, says El-Sisi. El-Sisi cites a number of projects that are seeking investment at the conference, including the planned reclamation of 4 million feddans of land , the digging of the new Suez Canal, the Suez Canal development project, the Golden Triangle project, as well as new airports, developing roads, waste management, mining and tourism. 16:20 "The stability of Egyptian society is stability for the region as whole,” says El-Sisi. “Egypt is a model for tolerant morals, a country that denounces extremism and violence,” he tells delegates. 16:15 El-Sisi also gives special thanks to Jordan and Bahrain, and “other Arab states” for their support of Egypt. 16:05 President El-Sisi begins his speech; he extends special thanks to Saudi Arabia, the UAE and Kuwait, three countries that supported Egypt with $23 billion in aid since Islamist president Mohamed Morsi’s ouster in July 2013. 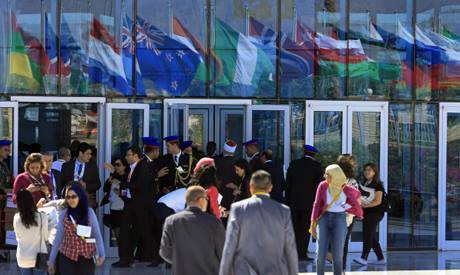 16:05 The economic conference officially begins with the playing of the Egyptian national anthem. 15:55 President El-Sisi is expected to address attendees very soon. 15:45 US Secretary of State John Kerry will be giving a live speech to conference attendees at 5pm local time, the American embassy in Cairo announced via Twitter. 15:20 British Foreign Secretary Philip Hammond has arrived in Sharm El-Sheikh at the head a British delegation, an hour ahead of the conference opening session. Since the ouster of Mohamed Morsi in 2013 the UK has reiterated its commitment to support Egypt economically, but has called for political inclusiveness and respect for human rights. 15:15 Over 1,000 journalists and media personnel are covering the economic development conference, state-news agency MENA reports. 15:00 A subsidiary of Chile's state oil company ENAP will invest $30 million to build a 90km oil pipeline in Egypt's Western Desert, the country's ambassador told Reuters at the conference. Jose M. De la Cruz said the pipeline would allow the company to extract oil from a new discovery west of Cairo and sell it to the Egyptian government, which is facing a severe energy crunch. 14:50 The head of the International Finance Corporation said that he was encouraged by Egypt's economic reforms such as cuts to costly fuel subsidies last year but called for more action to improve the investment climate, Reuters reports. "We are happy to see that progress but there is a lot more work that needs to be done. The sign is positive, we need to see more," Jin-Yong Cai told Reuters. He added that regulations and investment policies still needed to be improved. 14:45 The emir of Kuwait, Sheikh Sabah Al-Ahmad Al-Jaber Al-Sabah, arrived in Sharm El-Sheikh heading the Kuwaiti delegation, which includes representatives of Kuwait’s General Authority for Investment as well as Kuwaiti businessmen. Mahlab and Egypt’s Minister for Youth and Sport Khaled Abdel-Aziz received the Kuwaiti delegation at Sharm El-Sheikh airport. Kuwait has, along with the UAE and Saudi Arabia, been a key financial backer of the post-Morsi government in Egypt. 14:40 A scheduled press conference with Prime Minister Ibrahim Mahlab ended after Mahlab briefly apologised to journalists and then left without making further announcements, Ahram Online’s correspondent reported. 14:30 The African Development Bank is keen to invest in power generation projects, vice president Aly Abou-Sabaa tells state TV. "What we are currently trying to accomplish through our negotiations with the government is to diversify energy sources in Egypt," he said, citing two projects: a solar energy plant in Upper Egypt's Kom Ombo and a wind energy project in the Gulf of Suez. The bank is investing $500 million in Egypt in 2015,with a plan to provide the same amount annually in the coming 4 to 5 years, said Abou-Sabaa. 14:15 Delegations from around 100 countries and 25 regional and international institutions are participating at the economic conference, the foreign ministry said in a statement. Turkey, Iran and Israel have not been invited, as the “criteria do not apply to them in terms of the value of their investments in Egypt,” read the statement. Qatari representatives were invited and are attending, despite a chill in relations between Doha and Cairo since the 2013 ouster of Mohamed Morsi. 14:00 A closed meeting scheduled to take place between the Egyptian, Jordanian, and Palestinian heads of state and US Secretary of State John Kerry on the sidelines of the conference, state TV reports. 13:30 Ten projects related to the Suez Canal Logistics Hub worth a total of $15 billion will be presented at the conference, Hany Sarie-Eldin of Sarie-Eldin and Partners, the legal consultant for the Dar Al-Handasah consortium which has drawn up the blueprint for the project, told state news agency MENA on Friday morning. The focus of the projects will be on manufacturing, telecommunications, ports and logistics. The general plan for the project includes building more than 1,000 factories in its first phase alone, with investment costs for infrastructure amounting to $45 billion, said Sarie-Eldin. The logistics hub project is divided into industrial, residential and commercial zones, and aims to create a community in an area of 450 million square metres adjacent to the canal. The first phase of the project will connect the economic zone around the Suez Canal with Egypt’s yet-to-be-built new capital city, says Sarie-Eldin. The second phase will connect the Suez hub with the Sinai peninsula. 13:15 Egypt’s Minister of Irrigation Hossam Moghazi meets with European Union delegation to discuss Egypt’s One Million Feddan land reclamation project, state media reports. The project is part of a larger scheme to reclaim a total of four million feddans (acres) of land for cultivation, including land outside the Nile Valley, home to most of Egypt’s arable land. The project is was a cornerstone of President El-Sisi’s electoral programme. 12:55 State TV reports that there is a full fleet of medical professionals standing by in case they are needed by attendees at the conference. A hundred doctors and forty ambulances have been deployed to the vicinity of the event. 12:45 Egypt expects to finalise deals worth between $15 billion and $20 billion during the conference, state media reports, citing Minister of Investment Ashraf Salman. 12:40 On his official Twitter account, US Secretary of State John Kerry says he “looks forward to a busy day in Sharm El-Sheikh” adding that the key focus will be on efforts to promote shared prosperity in Egypt and across the region. Kerry, who arrived in the resort town earlier on Friday, also delivered words of encouragement for Egypt's efforts to attract greater foreign investment, reported AP. "This part of the world is blessed with a stunning amount of commercial potential," Kerry said at an American Chamber of Commerce event on Friday morning, adding that investment was needed to restore confidence in Egypt and provide stability for the region. He added that the US, whose companies invested $2 billion in Egypt last year, stood ready to help. 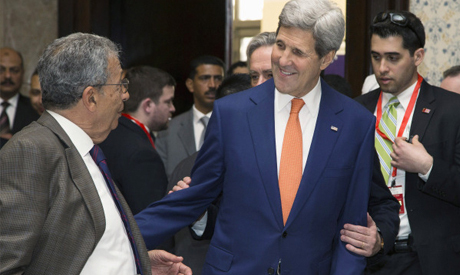 Kerry plans to meet with El-Sisi, as well as Palestinian President Mahmoud Abbas and Jordan's King Abdullah II. 12:30 The positive impacts of the economic conference will reveal themselves by the beginning of the final quarter of the fiscal year 2014/2015, according to Minister of Investment Ashraf Salman. "By the last quarter of the fiscal year 2014/2015, we will start realising some of the Memorandums of Understanding and start the implementation of ground projects signed during the conference," he added, in comments reported by state television. 12:25 El-Sisi has received UAE prime minister and ruler of Dubai Sheikh Mohamed bin Rashed Al-Maktoum at Sharm El-Sheikh international airport hours before the inauguration of the conference. The UAE has been one of Egypt’s staunchest economic allies since Mohamed Morsi’s ouster, providing Egypt with $9 billion in oil shipments this fiscal year alone. 12:15 General Electric is investing $200 million in a manufacturing and training facility in Egypt's Suez City, according to Reuters. GE has also delivered a shipment of 34 gas turbines to supply its grid with 2.6 MW to power 2.5 million homes starting May 2015, according to a company statement. Egyptians have experienced frequent power outages in recent years, especially in the summer when higher seasonal consumption outstrips energy resources. 12:10 Suma Chakrabarti, president of the European Bank for Reconstruction and Development, had a “good” meeting with Egypt’s Minister of International Cooperation Naglaa El-Ahwany, the bank tweeted. 12:00 Egyptian President Abdel-Fattah El-Sisi welcomes Saudi Crown Prince Muqrin bin Abdel-Aziz to Sharm El-Sheikh. The late King Abdullah bin Abdel-Aziz, who died in January, initiated the call for an international conference to help the Egyptian economy in the aftermath of the ouster of Islamist president Mohamed Morsi in July 2013. 11:55 In a side-interview with state TV, environment minister Khaled Fahmy reveals a new a biofuel project his ministry is proposing in cooperation with the agricultural sector. He says the project will cost LE1.2 billion, with Return On Investment of 40 percent and a payback period of four years. He added that the project will create 21,000 job opportunities. 11:50 Speaking to state TV from Sharm a moment ago, Prime Minister Ibrahim Mahlab said his government is committed to ensure a transparent and credible environment for investors. "Egypt is the future, it has a lot of undiscovered potential. God-willing it will be one of the leading economies in the world,” he said. 11:50 President El-Sisi has welcomed Sudan’s President Omar Al-Bashir. 11:45 Leading global figures have already arrived in Egypt's restort town of Sharm El-Sheikh on Friday for the opening of the country's economic development conference, which is scheduled to last until Sunday. Around 2,000 delegates from 112 nations, including 30 heads of state and executives of multinational companies, will attend the event, which the government hopes will kickstart the economy after four years of political turmoil following the 2011 uprising. The conference will showcase the country’s latest fiscal and legal reforms, and Cairo’s economic vision. The conference will also see various investment opportunities and projects in a variety of sectors presented to potential investors. Stay tuned as Ahram Online provides you with the latest updates from the conference. Oh they only help out terrorists, so the Amir preferred to go to Turkey. President Sisi promised hard work, and asked for the same from the Egyptian people to turn the country around. So far he has done more since ANY and ALL leaders put together since Mohamed Ali up to the terrorists puppet Morsi all put together. More construction projects more investment projects, more flow of opportunities for you Egyptians. The real question is what have some of you have done besides complaining and pontificating. As yourself that, and be honest with yourself... Hard as that may be. El-Sisi said "Egypt’s economy does not rely on mega-projects alone but on a clear economic vision committed to a free market economy and private sector participation" Now we need to publish this 2030 Economic Vision and rally the troops behind it. It looks like we are entering a new era where Egypt is focusing on the Economy not all other distractions.